The endodontist focuses ‘inside’ of the teeth (“endo” = inside, “odont” = tooth). Deep inside of each tooth lies a network of tiny, cavern-like passages called canals, which contain sensitive living tissue, including blood vessels and nerves. Treating the soft tissue inside the tooth, also called the pulp, is the primary concern of endodontists. In our everyday experience, we’re not usually aware of these minute canals, which extend from below the chewing surfaces through the roots of the teeth. But when something goes wrong with them, chances are we will know about it right away: Inflammation and pain in the tooth’s pulp can be quite severe. Getting relief from the pain and controlling an infection in the pulp tissue may require root canal therapy, or another treatment of the tooth’s soft tissue. These procedures, along with many others, are frequently performed by endodontists. 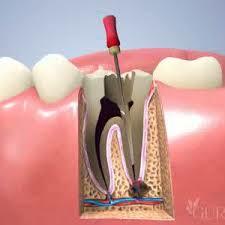 Root canal therapy is probably the most common treatment performed by an endodontist. It may be needed when the tooth’s pulp is infected—often as a result of untreated tooth decay or a traumatic dental injury. This procedure involves making a small hole in the affected tooth, removing the infected or dead pulp tissue, replacing it with sterile biocompatible filler, and sealing the tooth against reinfection. It is normally done under local anesthesia, and is performed using tiny dental instruments and, sometimes, a microscope. Despite some shopworn myths, root canal treatment rarely causes more than temporary minor discomfort; yet it generally relieves the acute pain of pulp inflammation. It has a success rate of about 95 percent—which often means saving a natural tooth that would otherwise have been lost. Since preserving the natural teeth is a primary goal of modern dentistry, an endodontist’s work is valuable indeed. Besides performing standard root canal treatments, endodontists often take on patients referred to them by general dentists, where complicating factors make treatment more difficult. They also perform endodontic surgical procedures such as apicoectomies, where infected tissue is removed from the tip of the tooth’s root. Additionally, endodontists are sometimes called on to perform endodontic re-treatment (where a prior root canal has failed), or to treat pulp damage in cases of traumatic dental injury. Their advice can be extremely helpful in situations where a difficult decision must be made: Is it worthwhile to try saving a tooth, or best to extract it instead? Although general dentists perform a large number of root canals, patients are often referred to an endodontist by their family dentist. This is sometimes done if you are experiencing confusing or non-specific tooth pain, or if a complication (such as a difference in your anatomy or a prior root canal) might potentially make your treatment more difficult. Or, you may be referred to an endodontist for a root canal before your dentist places a crown or another type of restoration on one of your teeth. If you have an ordinary toothache or tooth sensitivity, you are probably best off starting with your family dentist; your problem could be simply tooth decay or a loose filling, which can be conveniently treated by a general dentist. However, if you have a knocked-out tooth, a fractured tooth, or other serious dental injury, or are in pain from a pulp inflammation, you don’t need a referral to see an endodontist. These dedicated professionals are expert at treating problems deep inside the teeth—and they can often save teeth that would otherwise be lost to injury or decay.